Systems designed for use by communities tend to operate differently from back end or operational processes. Its only natural given the unpredictable nature of crowds. I’m sure there are a lot of people looking into this field, with greater experience and knowledge than I. However, I bring this up due to a recent event in an online community in which I have been participating actively since early 2007. And this experience made me reflect upon some of the issues that had emerged from the workshop we conducted late in November 2012 on sustainable agriculture value chain development for the lower income demographic in the developing world. 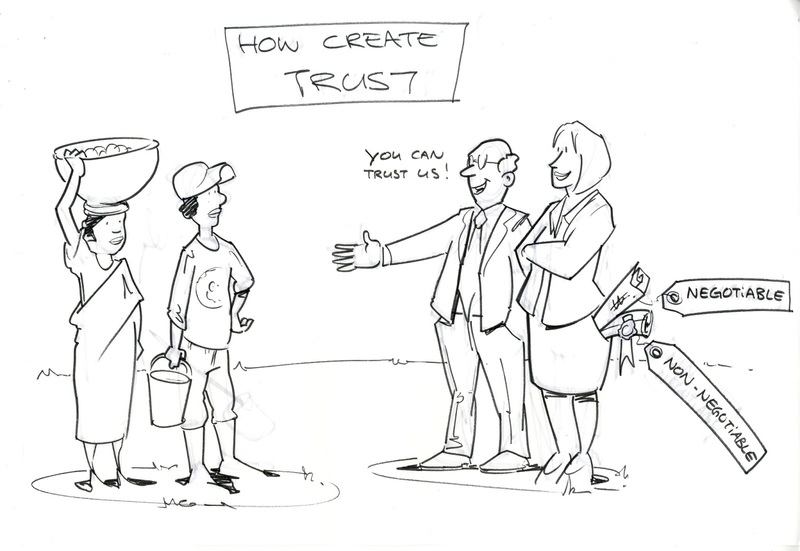 That trust is the key to success for any programme meant for a human population is unarguable. The challenge is to establish the foundations for gaining, building and maintaining trust, that too with a large community or groups of peoples rather than individuals on a one on one basis. When technology is added to the mix as a mediator for communication flow, then one further layer of abstraction is added to the challenge, that of lack of nuance and meaning that body language and tone of voice, among a myriad other things, add to face to face communication. Complicating this is also the difference in contextual knowledge – exposure and experience – between segments of the global population. The OECD world and its ilk, aka mainstream consumer culture, have been exposed to and immersed in a far more technological environment full of touch screens, apps, software and the ubiquitious Internet. While mobile phones are increasingly bringing the world to every human’s fingertips, one can hazard a reasonably accurate guess that the majority of the world’s lower income demographic residing in rural regions of the developing world probably will not possess the same or similar level of experience. Thus, any human interaction system meant to reach this population must embody flexibility and responsiveness, in a consistent, close to realtime way, in order to build and maintain trust with the community. And one way would be to clearly establish the boundaries of the flexibility of the system, that is, the negotiable and the non negotiable. Feedback mechanisms are without value if the system itself is too rigid in its originating design or the responses too random or reactive.